You must defend your computer at all costs! Happy Mother's Day! Protect your own mother from pickpockets! Defend your nuts! Grab your bow, grab your shotgun, build your fences and defend your nuts from hordes of skeletons, orcs and bees! Atlantis is under attack and its up to you to defend it - with bubbles! Use the mouse to trap enemies and save the city. Castle is under attack, and it is your job to defend it! Defend the caravan from a band of brigands. Build up new weapons in your arsenal. Your job is to protect the dirt pile as it grows. It's really as simple as that. Pick up power-ups to help ward off the bad dirt stealing thingies. Defend your picnic from the army of ants! Protect your temple, buy new guns and purchase upgrades while collecting shekels. Happy Hanukkah! 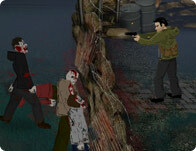 Save your temple against the invading enemies using a variety of guns and upgrades. Defend your tree with your mad archery skills. Those rampaging stick mythic creatures don't stand a chance of surviving your hail of arrows! Monsters of lore and legend have begun their assault upon your homeland! Stop them cold and send them back whence they came with a maze full of sniper, gun, frost and flame towers! Defend yourself from helicopters, tanks, infantry, paratroopers and stealth bombers. Unlock loads of achievements and upgrade your auto fire turret to deal with the worst the enemy has to offer! You shoot stuff up, get points and money, and when the game day is up, you get to buy stuff. Choose from 8 generic survival/defense games or create your own custom game of doom! Kill these killer shapes before before they get to you!